"A 'can't put it down' love story." Ellie Aubrey, a woman with extraordinary abilities, has spent centuries in hiding along with her twin brother, Griffin. They are hiding from the Vyusher, a rival tribe that had destroyed her entire powerful family. Until the day this woman with BLUE VIOLET eyes has a mysterious dream, then Ellie must risk discovery in order to find and watch over the Jenners, another group of similarly gifted people. She refuses to let them suffer the same fate her family had. Alex Jenner has come home to protect his family. His adopted mother can sense danger coming, but not who or when. Suspicious of the new girl in town, Alex challenges Ellie in ways that will spark one of two possible outcomes: they will spontaneously combust or she will lose control of the one power she has fought the hardest to contain. When the Vyusher once again threatens everything she holds dear, Ellie will have to face her worst fear and Alex will face an impossible decision. In this fairytale, the dragon that the prince must slay is also the princess who holds his heart. BLUE VIOLET is an amazing, don't-you-dare-put-it-down, read. Ellie looks like a typical teen but you have to add a few hundred years to get her real age. She thinks she and her brother are the last remaining Svatura until a dream sends her rushing to check out another family. Alex is at first wary of the "new" girl in their midst but then his heart kicks into action. This is a different type of paranormal and I understand it is a re-release of author Abigail Owen's "Svatura" stories, with new and beautiful covers. Having not had the opportunity to read the originals I found this book fresh, inventive and just darn good. I am not into teen, young adult stories but the fact that these young people are really centuries old made them intriguing to me. 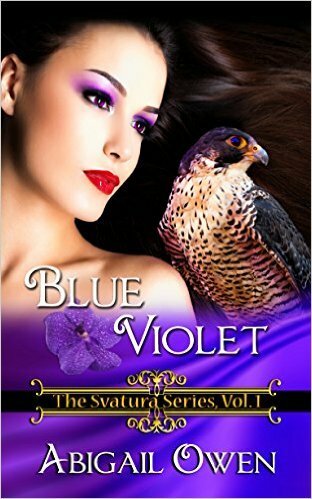 You will have to read BLUE VIOLET to find out just what Ellie's hardest to contain power is and what it really takes for her to control it. The romance is sweet and the overall vibe is love, acceptance and family, something that Ellie was searching for and something she gets. I cannot wait to get my hands on the next Svatura story. Ellie Aubrey is a centuries-old gypsy princess whose extraordinary abilities once inspired her Roma ancestors' fairytales (or nightmares). Along with her twin-brother, Griffin, Ellie has spent most of her life hiding from the Vyusher, a rival tribe who destroyed their entire powerful family. But after a mysterious dream, Ellie risks discovery in order to find and watch over the Jenners, another group of similarly gifted people. She refuses to let them suffer the same fate. Alex Jenner has come home to protect his family. His adopted mother can sense danger coming, but not who or when. Suspicious of the new girl in town, Alex challenges Ellie in ways that will spark one of two possible outcomes: they'll spontaneously combust, or she'll lose control of the one power she's fought so hard to contain. When the Vyusher once again threaten everything she holds dear, Ellie will have to face her worst fear, and Alex will have to face an impossible decision. In this fairytale, the dragon that the prince must slay is also the princess who holds his heart. �In this weather?� Ellie teased. She was rewarded with a deep chuckle that danced up and down her spine. �Hey, maybe we could run together some time,� he suggested. Ellie gave silent thanks that he hadn�t noticed her reaction to him. �Maybe�.� Ellie nodded and smiled to take the sting out of what could�ve been perceived as a rejection. �Answer with something vague.� He sat back, letting her breathe normally again. �Do I?� Ellie feigned surprise. Impressive. Most people don�t even notice when I�m giving vague answers. �Huh.� Ellie grimaced and tried a different approach. �I don�t even notice I�m doing it. I guess I don�t talk about myself much in general.� Especially to hot guys who have no clue who I really am. Ellie laughed. Clearly she wasn�t going to get away with keeping her distance. Not that she wanted to. She was just trying to avoid further complication. And Alex Jenner had the potential to be a rather major complication. Re: A 'can't put it down' love story.